You are here: Home / Holidays / Christmas / What About Santa? What about Santa? I know throughout the years when we were raising our kids we struggled with “public opinion” when it came to our homeschooling choices, our choice to not celebrate Halloween, and to tell our kids that there was no Santa, Tooth Fairy, or Easter Bunny. People felt like we were stealing our kid’s childhood from them. When our first was too young to know about any of these things, my Mom said something to me and I took it to heart. Let me start by saying in my house growing up, we believed in and celebrated all of the above. 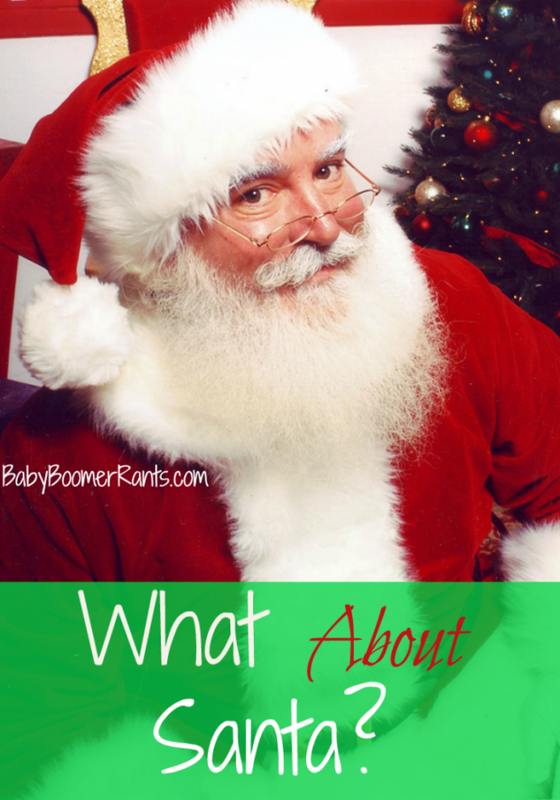 I had never thought I would do anything different with my kids until my Mom said this: “If you tell your kids there is a Santa Claus, Tooth Fairy, and Easter Bunny and they eventually find out they don’t exist, what will they think about God and Jesus? They saw the Easter Bunny, Santa, and Tooth Fairy on TV, in books, and at the mall, but they weren’t real. What about God and Jesus? Is that just a fairy tale, too? As adults we know that it’s all about faith and that would be a great lesson for the kids when they find out about these things, but, I felt if I just told them ahead of time, we could avoid any of the unspoken thoughts they might have as they grew. Now, don’t get me wrong, we have plenty of pictures with them on Santa’s knee, and we played the Tooth fairy when they lost teeth, and we hid Easter baskets on Easter and had egg hunts. It didn’t mean we couldn’t still do those things, it just meant that our kids knew it was just fun and they knew the real meanings behind Christmas and Easter and that didn’t get lost in the activities. Now we did have one downfall in all of this, besides family and friends thinking we were mean to our kids for telling them the truth. When our daughter was in kindergarten (before we began homeschooling) a teacher friend and I babysat many kids after school everyday together. One day the principal called me after school and told me that my daughter had been telling her classmates there was no Santa and the school was getting phone calls. She asked me to tell my daughter not to tell the other kids. I was fine with that. I hung up the phone and all of the kids we babysat from school were playing in the backyard. I called my daughter in, explained the situation, and told her that other parents wanted their kids to believe in Santa and that we needed to not tell them that there wasn’t a Santa Claus. Ok, so yes, I laughed quietly and shook my head… lol kids! Someone also told me about this great book that I absolutely loved when my kids were young: Santa And The Christ Child. It’s a great way to integrate both. I love the book and so did my kids. How do you handle these things with your kids?